A pretty young woman poses for her portrait at a photo studio in Springfield, Massachusetts. The photographer of this cabinet card photograph is H. E. Bosworth. The subject of this photograph appears to be in her teenage years or slightly older. She has beautiful eyes. Note her hair ornament. Langdon Road reports that in 1899, Bosworth’s studio was known as Bosworth & Murphy. Research reveals that Bosworth was very active in his state’s Photography Association. This cabinet card portrait is in excellent condition and has excellent clarity (see scans). The identity of the gentleman pictured in this cabinet card portrait is Caleb Lysander. The previous owner of this image reported that it comes from an album that makes this positive identification. The subject has an interesting billy goat beard. To view other notable beards, click on the category “Beards (Only the Best)”. The cabinet card was produced by the Howe studio which was located in Brattleboro, Vermont. A Brattleboro history internet site includes a biography and obituary of Mr. Caleb Lysander Howe. The article states that upon his death, his daughter, Mrs Mary Howe-Lavin was informed via cable to Paris where she was performing as a singer. Howe was born in Dummerston, Vermont, in 1811. At age two, he moved with his parents to Dover, Vermont. His father worked as a farmer and had a second business providing transportation between Dover and Boston. Howe worked on the family farm until he was about sixteen when he went to learn a trade as a machinist. At age eighteen he moved to Brattleboro to work in a machine shop. While in the role of machinist, he worked as a watchmaker and producer of jewelry. He married Miss Cynthia Sherman who was from Dover. In 1838 he leased a farm in Dover. He became interested in photography in about 1846 and soon purchased a photography studio where he started out producing daguerreotypes. He then purchased a four wheel car for three hundred dollars and added traveling photographer to his job description. He did most of his work within his county. It is reported that he made a profit of between one hundred and two hundred dollars a month. He came to Brattleboro in 1856 and purchased a photography gallery. He became quite successful as a photographer. In 1880 his son, John C. Howe became associated with the business and the studio became known as C. L. Howe & Son. 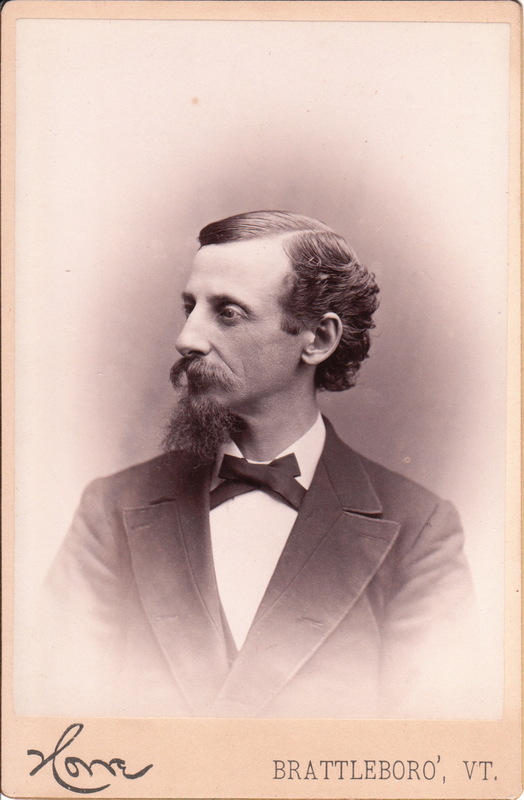 The senior Mr. Howe was highly regarded throughout the county as a teacher of vocal music and as a tenor singer. He died in 1895. There is a possibility that this is a self portrait. In other words, Caleb Lysander Howe may be the subject and the photographer. Research found an engraved portrait of Howe that looks similar to this cabinet card image. As a side note, research found a number of references to C. L. Howes prima donna daughter. 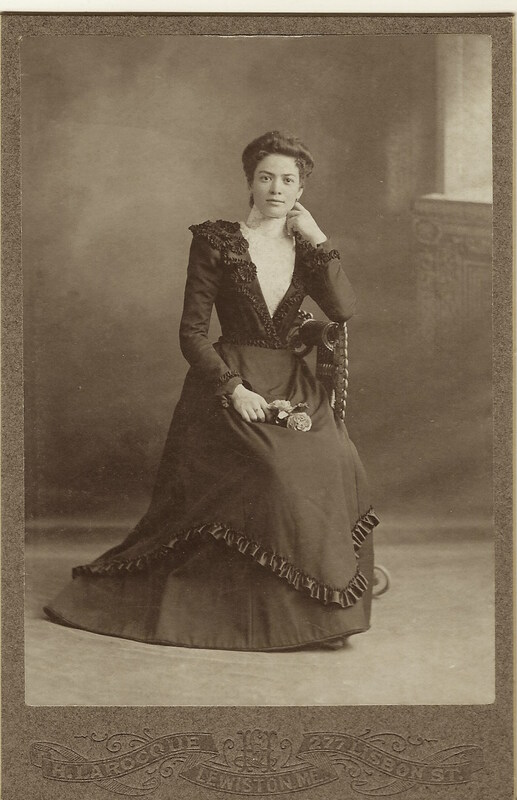 The book “Picturesque Brattleboro: With Over Two Hundred Illustrations (1894) describes Mary Howe-Lavin as a “beautiful songstress” and states that “there is something indescribably fascinating in the singing and personal appearance of this charming woman”. References reveal that she performed in a number of major cities in Germany. Her second wedding was announced in the New York Times (1905). This cabinet card is in very good condition (see scans). The woman in this vintage photograph is both beautiful and well dressed. She exhibits an engaging smile as she poses for her portrait at the studio of H. Larocque in Lewiston, Maine. She is wearing a high collared dress and holding flowers in her lap. She is likely wearing a corset judging by her tiny waist. The photographer of this image is Henri Larocque (1859-1922). He was born in Quebec and died in Lewiston. He was married to Mary Hinse Larocque (1867-1956).Henri is listed in city directories as a photographer at least as early as 1887. The 1920 US census also lists him as a photographer along with his son George (age 33) and daughter Emmilene (age 31). Henri and his wife are buried in St. Peter’s Cemetery in Lewiston. This vintage photo is in excellent condition (see scans).